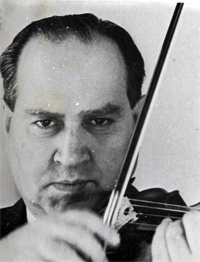 One of the greatest violinists of the 20th century, David (Fyodorovich) Oistrakh (1908-1974) began studying the violin at age five in Odessa, Ukraine, with P. S. Stolyarski. Graduating from the Odessa Conservatory in 1926, he moved to Moscow, where he was in 1934 appointed to the faculty of the Conservatory. He gave recitals throughout the Soviet Union and eastern Europe and in 1937 won first prize in the Eugène Ysaÿe Violin Competition, which launched his international career. In 1942 he received the Stalin Prize. He toured extensively through Europe beginning in 1951, and through the U.S. as soloist with major American orchestras and in recitals from 1953, winning enthusiastic acclaim. Oistrakh also made appearances as a conductor from 1962. Regarded as the finest Russion violinist after Heifetz, Oistrakh combined a phenomenal technique, with one of the most rich and noble tones ever and astylistic fidelity to works by different composers of different historical periods. Soviet composers requested his advice as to technical problems of violin playing. As a an outstanding pedagogue, he counted a whole generation of Soviet violinists among his pupils, including his son Igor.